We’d love your help. Let us know what’s wrong with this preview of Clan Lord by Joel Babbitt. Science Fiction Adventure at the Edge of a Universe at War! The Life Sticks science fiction adventures bring a completely alien culture, a convincingly original alien race, and an intense series of surprising plot twists to the reader through the eyes of a young adult coming of age at the edge of a Galactic War. Don’t just join the Clan… OWN the Clan! The story of Razz t Science Fiction Adventure at the Edge of a Universe at War! The story of Razz the clan-less is triumphant, exultant, and redeeming. Once you enter his world, you will never be the same again. In this pilot episode of the Life Sticks Short Stories, a young outcast from a primitive race fights for his place in the clans of his home forest. But unbeknownst to him, the humans from a distant star have made a deal with his clan lord that will forever change his destiny. Available for free to Amazon Prime customers. Also available in paperback. To ask other readers questions about Clan Lord, please sign up. Long ago I read and enjoyed the science fiction novels of Hal Clement and loved his intricate creation of alien worlds and races. More recently I delighted in the curious creatures of Orson Scott Card’s foreign planets. Joel Babbitt’s Clan Lord offers that same sense of the strange; creatures unlike ourselves, living in cultures unlike our own, interacting differently with land, sea and sky, and thinking convincingly about the paths of their lives. The writing is smooth and fast-flowing. The worl Long ago I read and enjoyed the science fiction novels of Hal Clement and loved his intricate creation of alien worlds and races. More recently I delighted in the curious creatures of Orson Scott Card’s foreign planets. Joel Babbitt’s Clan Lord offers that same sense of the strange; creatures unlike ourselves, living in cultures unlike our own, interacting differently with land, sea and sky, and thinking convincingly about the paths of their lives. The writing is smooth and fast-flowing. The world-building’s natural and convincing, without intrusive data-dumps. History and culture build well through the thoughts and actions of nicely-drawn characters. And there’s just enough science fiction mystery to anchor this story firmly in the future and outer-space. I’m sure there will be more adventures to come in the series, and I’d love to read them. Disclosure: The author kindly gave me a free ecopy of this story and I offer my honest review. Clan Lord, what an interesting take from the point of view of an alien race. The story was amazing, creative and endearing. With quite a few unexpected plot turns. I wish it wasn't a serial, because now I want to know what happens next. I got a taste of a wonderful new world, presented in a wonderful new and refreshing light, that was cut short. Finally a new story, with new creatures, and a new stage. I didn't have to deal with another repeat of the same thing. It wasn't all puppies and butter Clan Lord, what an interesting take from the point of view of an alien race. The story was amazing, creative and endearing. With quite a few unexpected plot turns. I wish it wasn't a serial, because now I want to know what happens next. I got a taste of a wonderful new world, presented in a wonderful new and refreshing light, that was cut short. Finally a new story, with new creatures, and a new stage. I didn't have to deal with another repeat of the same thing. It wasn't all puppies and butterflies though, the author did at times come up a little dry in his descriptions, and areas where I wanted more details (i.e. the action/fighting/training scenes) didn't come up to luster. Of course this is a serial and is in some respects to be expected. I've been getting very tired of rereading the same story, presented in a new light. With the Clan Lord I didn't have to, I got to jump into the beautiful world of Razz. A yazri, who wants one thing in life, to get to the top of the social chain, and become the Clan Lord. At only 54 pages long, it contains elements of a much larger novel, with plenty of action, intrigue and betrayals to keep the pace steady. Even though a novella in the first of a series, author Joel does a great job of laying the foundation for following books. Open-ended, but not disappointing. The reader will find themself hooked, and wanting more. ***The author kindly provided a copy of the book for a fair and honest review. I an a little shocked that this is a short story. It felt like the first few chapters of a much larger novel and a great introduction to the world and the creatures that live there. It never felt too forced or too confusing. It could have done with a few more explanations and descriptions of the creatures and customs, but I thought Babbitt did an excellent job in the handful of pages. I listened to the audiobook, read by the author. I don't believe Babbitt is a professional narrator, but he shou I an a little shocked that this is a short story. It felt like the first few chapters of a much larger novel and a great introduction to the world and the creatures that live there. It never felt too forced or too confusing. It could have done with a few more explanations and descriptions of the creatures and customs, but I thought Babbitt did an excellent job in the handful of pages. I listened to the audiobook, read by the author. I don't believe Babbitt is a professional narrator, but he should consider it. He has an excellent voice for the sci fi genre and with a bit of practice I think he could be very good at it. This is a great little sci fi book that displays a lot of imaginative ideas. It's a short read, but it was perfect for listening on my drives to and from work for the past couple days (I have quite a commute). I won this book from a Goodreads giveaway which included an audio version on a CD and a sweet note from Joel Babbitt on the inside cover. I would definitely recommend the book. It's a great story with an amazing author. "Clan Lord" is very good. From the description, it definitely sounded interesting. Though beginning the story I wasn't sure if I was going to enjoy it or not. I did enjoy it. And by the end, I was wishing that it was longer so that I could go on reading immediately. "Clan Lord" has a fair amount of action. As well as deceit, a few unexpected twists, a bit of a minor romance, and justice for those that I see as the wrongdoers. I'd definitely like to read more. I won this book through Goodreads giveaways. I was not overly impressed by it. It is well written but I had trouble getting into the book/identifying with the main character. I wouldn't tell people not to read it, but I don't believe I will be reading any other books in this series. This was a very nice little story. It was a very short read and I wish it was longer. I hope the author continues the story of Razz as it has a great potential to be a wonderful series. I loved this book. It's a short easy read that will leave you wanting more. Joel Babbitt is very creative and talented. I highly recommend this book! I have two different ways of reading. The first is the most commonly used: Reading for enjoyment. Books, blogs, whatever, just reading to read. The second is the kind used when I'm editing something. When a book or story has enough poor wording, typos, and spelling mistakes, I can't help but slip into that second kind of reading. Clan Lord made my hand itch for a red pen. We call those who give us I have two different ways of reading. The first is the most commonly used: Reading for enjoyment. Books, blogs, whatever, just reading to read. The second is the kind used when I'm editing something. When a book or story has enough poor wording, typos, and spelling mistakes, I can't help but slip into that second kind of reading. Clan Lord made my hand itch for a red pen. We call those who give us life yiziri, for they are to be protected; women in the speak of the star-people. I've never said this of a book before, but there was way too much hyphenation. Star-people, mid-night, hu-man, clan-less. That last one was used a number of times per page, and it was the one that bothered me most. It was a term the characters used, everyone was a member of a clan or not, so they'd likely think of it as a word, clanless. Unfortunately there were many typos and grammar issues. Fir instead of fur, "enemies wings" instead of "enemies' wings", missed commas in dialogue tags, and other such things. The larger warrior looked down on my young body, already hardening with the hormones of adolescence, assessing me, judging me for my fitness for such a thing. The author meant his muscles hardening over time, not *cough* something else. I won a copy of this book from a Goodreads Firstreads Giveaway. Apologies to the author for taking too long. 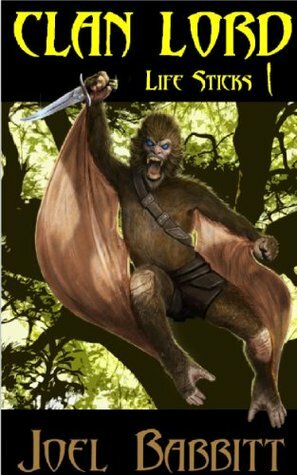 This little novella caught my attention was the fact that the main character of this sci-fi what-I-presume-to-be-a-serial was the fact that the main character of is that flying ape-man on the cover rather than a human, which I thought was rather interesting. As this is a short work, my critiques and compliments will be short as well. First, the bad; I would have liked more descriptions of t I won a copy of this book from a Goodreads Firstreads Giveaway. Apologies to the author for taking too long. As this is a short work, my critiques and compliments will be short as well. First, the bad; I would have liked more descriptions of the species, and especially the main character. Some descriptions of the culture were needed too. For instance, I was lead to believe that the rulers of each clan took multible wives, but later, they seemed to be monogomous when one character gets in deep when discovered he had a child outside of his marriage. Most sci-fis have an ignorant human in the mix (or as a protagonist) so things can be explained to the audience. I'm not suggesting the author do that, but perhaps if Razz, in his narration, were actually explaining this to humans who knew nothing? I don't know. I received this book through Goodreads' first reads program. I was initially a little put off by the cover image and the slim-but-oversized format. I don't read a lot of short-story collections, and the last serial I read was Stephen King's The Green Mile (when it was originally published). I believe each book of The Green Mile was also 3-5 times as long as this. However, I took the low number of pages as an added encouragement to get on with reading it. What I found was a story that was roughly I received this book through Goodreads' first reads program. I was initially a little put off by the cover image and the slim-but-oversized format. I don't read a lot of short-story collections, and the last serial I read was Stephen King's The Green Mile (when it was originally published). I believe each book of The Green Mile was also 3-5 times as long as this. However, I took the low number of pages as an added encouragement to get on with reading it. What I found was a story that was roughly half world-building and half action, and did both fairly well. There was enough to keep me interested and wanting to read more. The author did a good job building a world that felt like it had some depth, history, and culture without needing to expose much of it in detail, which helps significantly in such a short format. The down-side came in the last few pages, with a bit of deus ex machina to bridge the gap between where the story lead and the ending the author had in mind. I'm quite new to Goodreads, but in the brief time since I started using this site I've already managed to win a book through Goodreads First Reads program! That book is Joel Babbit's "Clan Lord", first episode of his new serial "Life Sticks". "Clan Lord" is a fast-paced science fiction novella written in the first-person perspective of a young male in a society of warriors. At fifty-four pages long it makes for a quick read, but those relatively few pages are about as action-packed as could be, s I'm quite new to Goodreads, but in the brief time since I started using this site I've already managed to win a book through Goodreads First Reads program! That book is Joel Babbit's "Clan Lord", first episode of his new serial "Life Sticks". I've been listening to audiobooks of old sci fi (like, from the 50s and earlier). I recently "read" Tarzan. This... felt a lot like that. Not in terms of specific plot, but in terms of the main character being a Manly Man, whose sole purpose in existence was to be a Manlier Manly Man than all the other Manly Men. Plus, a lot of the simultaneous contempt for "civilization", and fascination with the things "civilization" produces. It was tolerably well-written and all, it just... didn't really g Eh. It was tolerably well-written and all, it just... didn't really grab me. I will start by saying I got this book from the giveaways. While I would probably not normally choose a book of this genre, I did enjoy reading it. The very beginning was a little slow, for me personally, but I still found myself wanting to find out about the characters. Characters are relatable and nicely done. The plot, once set up, is interesting. And I find myself wanting to know what comes next. Babbitt's sci-fi world is well-imagined, even if I could not figure out exactly how the humans got to this planet filled with a flying monkey-like race, and why exact they needed them. Razz is an interesting protagonist, although the title kind of gives away what happens to him in this first installment. Good book, Think this is a great book for YA. The book was easy to understand and follow. I would recommend this book to anyone. I think the series will be a fun one. It was a great concept but I wish there was more details. Not one of my favorites but it wasn't the worst thing I've read lately. Joel Babbitt is a colonel in the U.S. Army and a bishop in his church. He has spent his entire adult life living and teaching principles of leadership and team building in a warrior environment. Joel lives with his wife and 4 children in Virginia. Sign Up to be notified of Future Releases and receive a FREE Short Story! http://autho Joel Babbitt is a colonel in the U.S. Army and a bishop in his church. He has spent his entire adult life living and teaching principles of leadership and team building in a warrior environment. Joel lives with his wife and 4 children in Virginia.